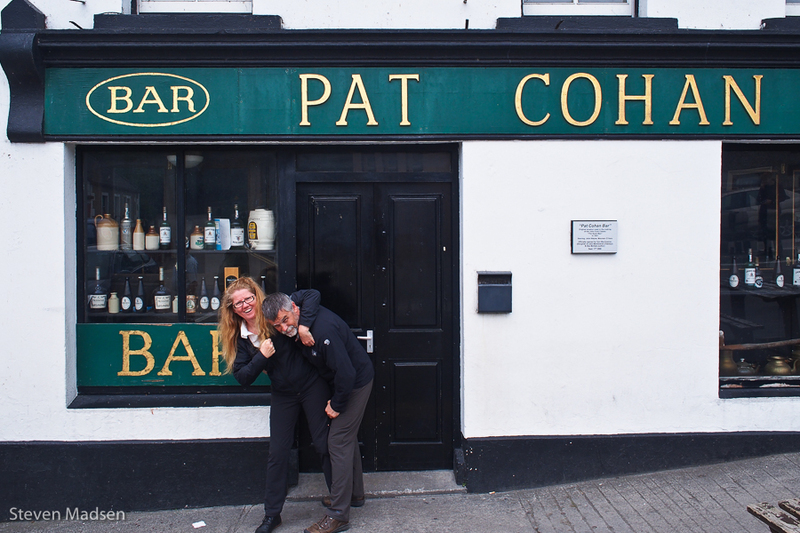 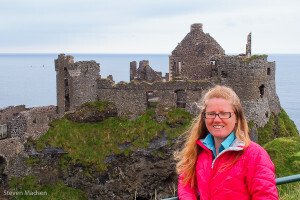 Colleen joined The Gathering, Ireland’s call to expatriates and their descendants to return to the homeland in 2013, after our Rick Steves’ tour ended and we trekked back across Ireland to Ballyshannon and her family home Cavangarden House. The Atkinson family moved from Yorkshire to Ballyshannon during the Ulster Plantation, and William Atkinson became one of 12 Burgesses who controlled the Ballyshannon corporation under Royal Charter from King James I. The family lived and prospered in County Donegal until 1968 when the last surviving direct descendent passed on leaving Cavangarden House to a friend. 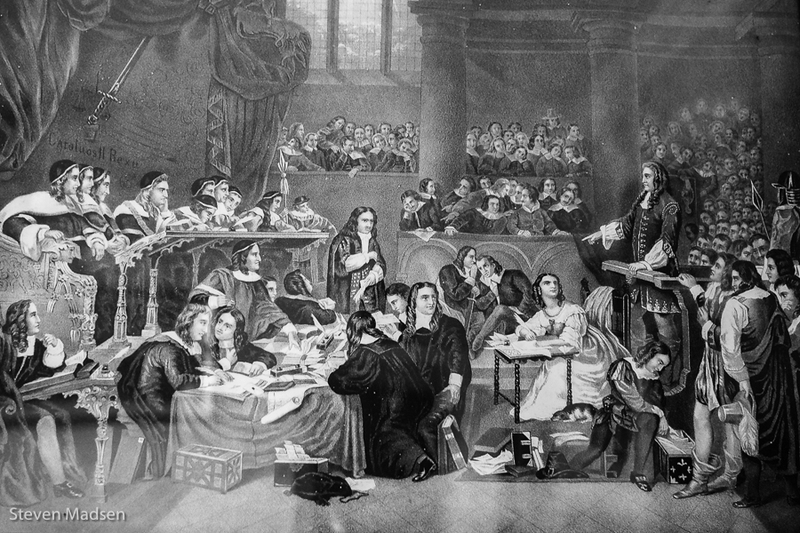 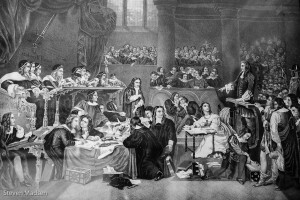 The Atkinson family had strong ties to Trinity College in Dublin, and successive generations practised Law in Ireland’s Legal system participating in many landmark trials as depicted in etchings that hung in Cavangarden. 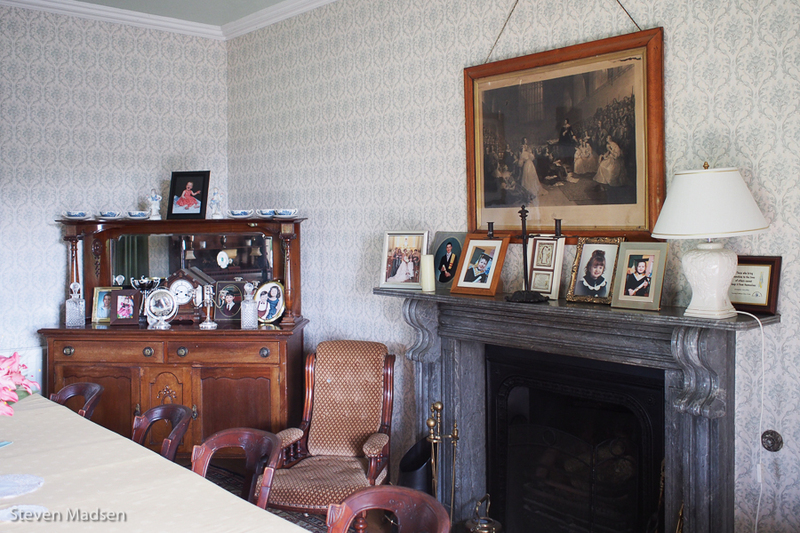 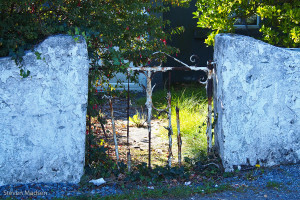 With keen interest in her heritage, Colleen discovered that Cavangarden House had become a bed and breakfast and thus a stay in the ancestral home became a central aspect for our Ireland travel plans. 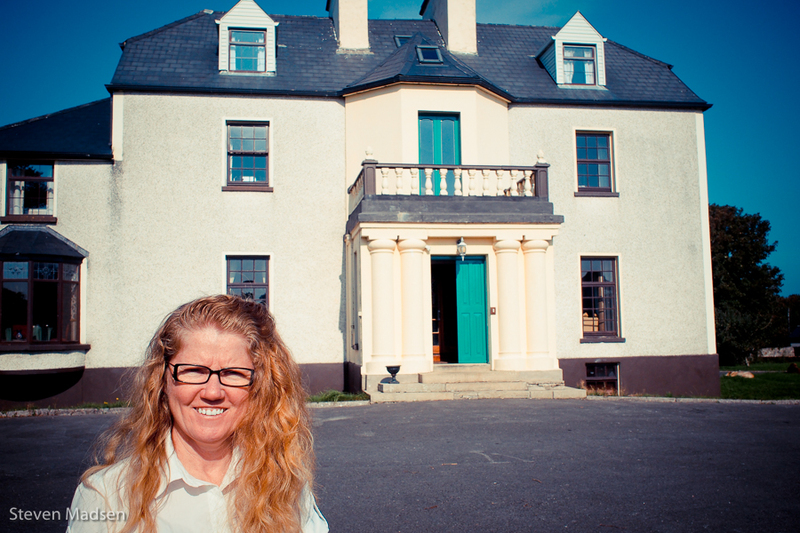 Agnes, the current owner, welcomed us warmly and provided Colleen with many insights into her family’s history in Ballyshannon. 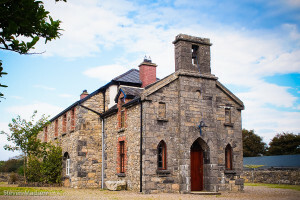 We walked the grounds, thumbed through books once owned by Colleen’s cousins and marvelled at the etchings depicting their prominent role in Donegal and Irish history. We journeyed out to the local Protestant Church to visit the Atkinson family plot, and walked through fields to the tumble downed remains of Kilbarron Castle tracing Colleen’s routes in the region. It was fascinating to watch Colleen as she joined the dots of her family history in the region, and while we only scratched the surface we know a longer stay in Ireland is in our future to dig deeply into that heritage. It is not the literal past, the “facts” of history, that shape us, but images of the past embodied in language. 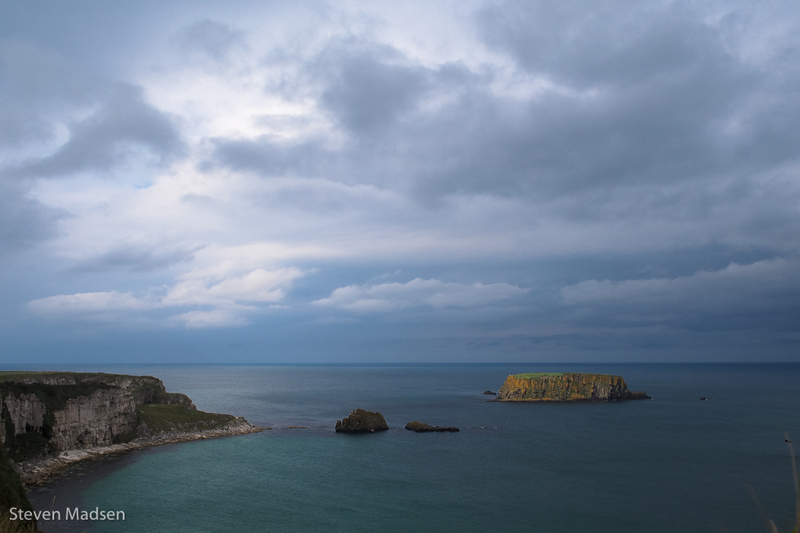 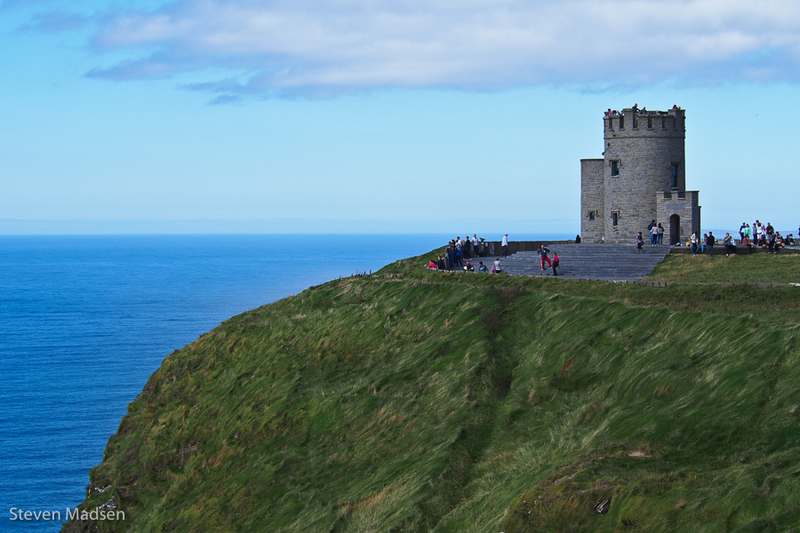 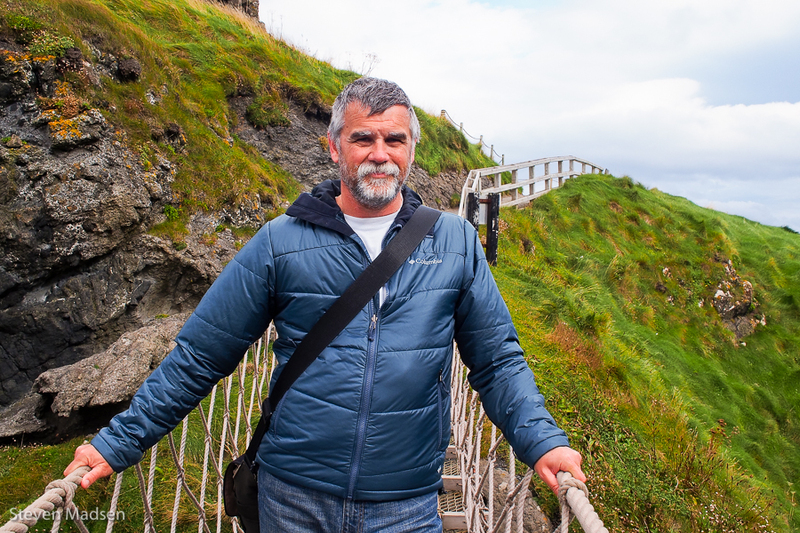 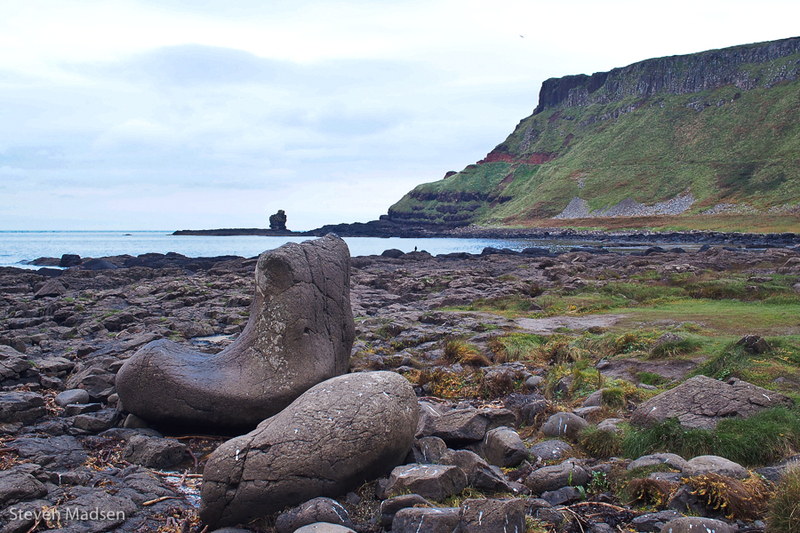 The Antrim Coast is stunning, whilst the Giant’s Causeway is the main attraction the coastline is littered with soaring cliffs, abandoned castles, beaches and the Bushmills Distillery. 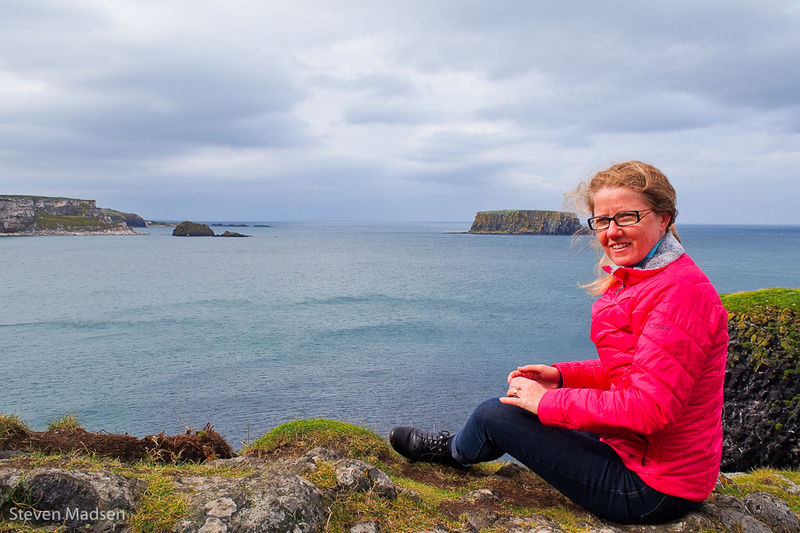 We enjoyed a pleasant day driving along the coast, gazing out across the Irish Sea to Scotland laying on the horizon so close it appears as if an extra low tide may allow you to walk there. 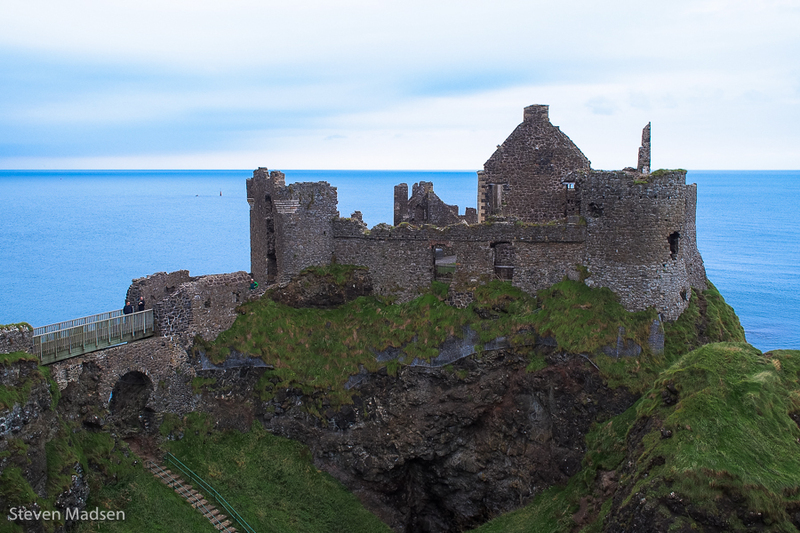 Fans of Game of Thrones can check out a film location down to the left of the main car park. 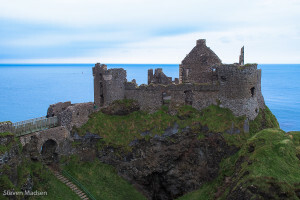 Dunluce Castle is one of the finest castles in Northern Ireland but not nearly good enough for the Countess of Antrim who begged her husband for a new home away from the coast and finally left without him when the kitchen disappeared into the sea during a dinner party. 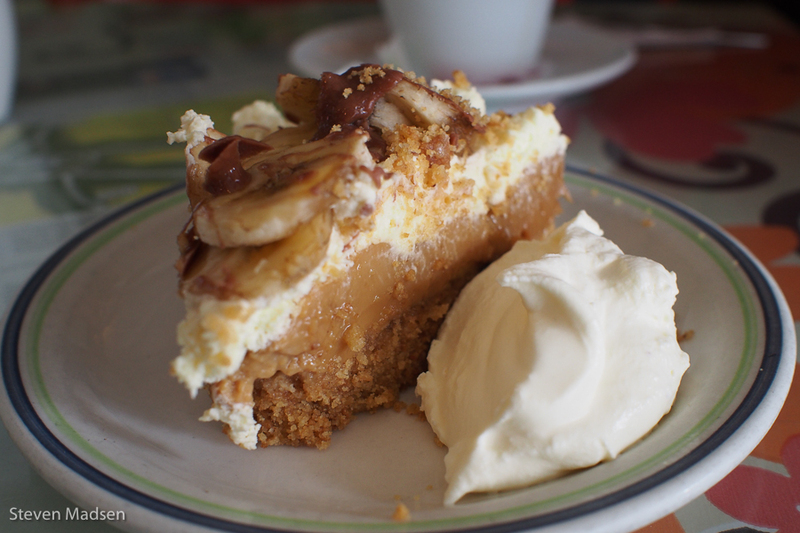 According to legend, taking the heavy dessert and most of the staff with it. Old Bushmills Distillery has produced fine Irish Whiskey since the 17th Century, and every year hosts 120000 visitors on an intoxicating tour of their facility. The air is literally steeped in whiskey, and the distillers only spend two hours tending to the distilling process at a time to ward off the effects. 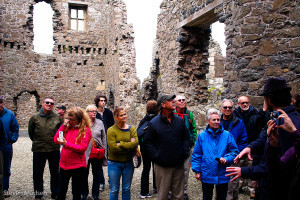 It’s a fun tour, a chance to indulge in some history and distilling folklore before exiting into the cafe where you can sip a free sample over lunch. 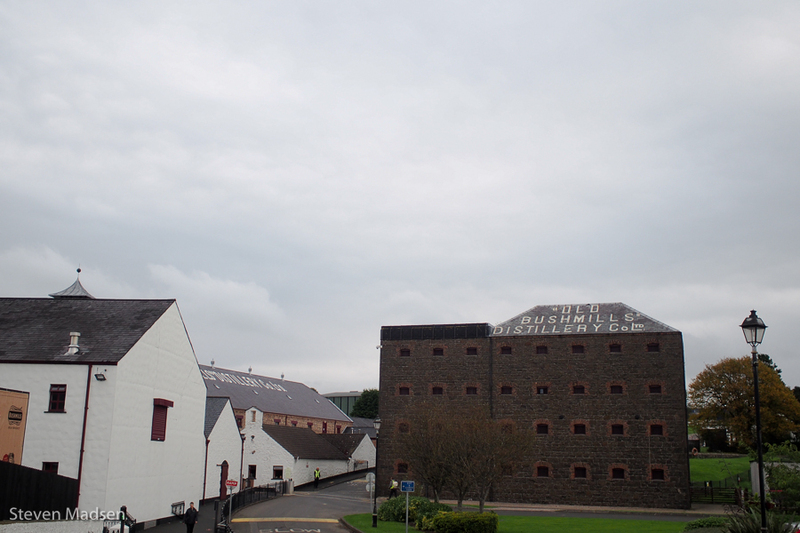 You can buy a 12 year old bottle of Bushmills at the distillery (not available elsewhere) but buyers of the widely distributed 10, 16 and 20 year old Bushmills may well find a better price at Duty Free than the distillery. 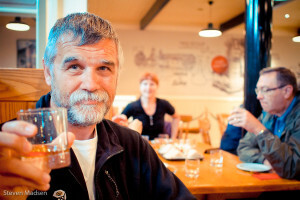 Enjoying a Whiskey at Bushmills. 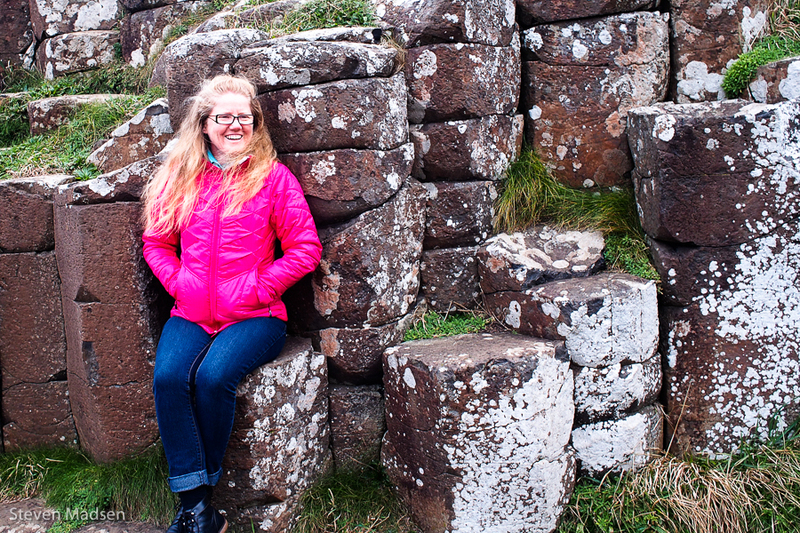 Giant’s Causeway – A Link to Scotland? 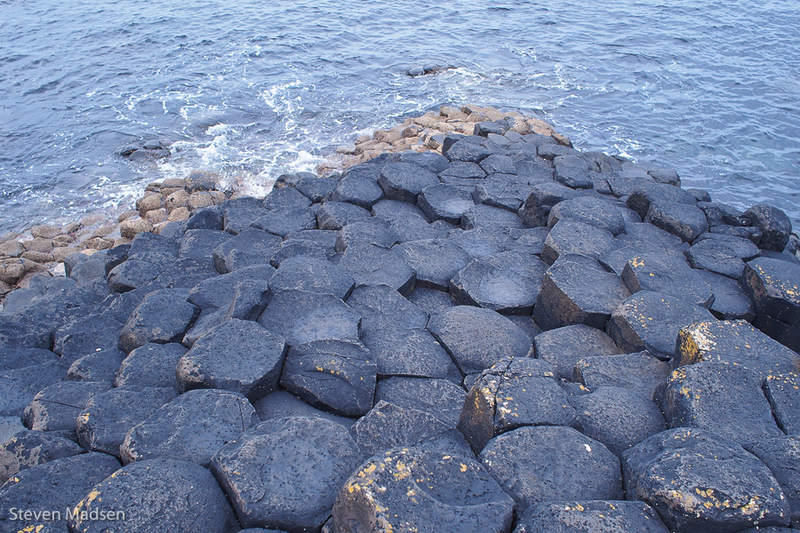 An Irish giant challenged his Scottish counterpart to a fight but soon realises he is outmatched by the bigger Scottish giant. 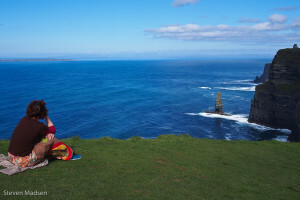 The Irish giant dons baby clothes, and when the Scottish behemoth sees this massive ‘baby’ he flees in terror smashing the causeway that connected their countries behind him. 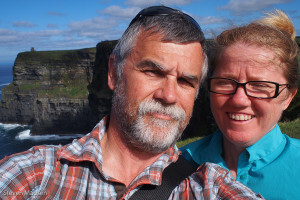 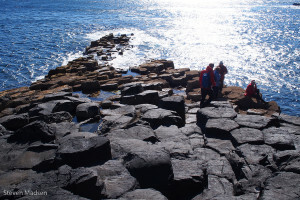 Like many tales there may be an element of truth to this fable, a few weeks before we arrived on the Antrim Coast, Colleen and I sailed to Staffa Island to see Fingal’s Cave. 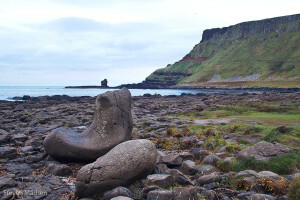 As you can see in these two photos, the basalt formations of the Giant’s Causeway are replicated on Staffa, and the Causeway points in its general direction north of the Antrim Coast. 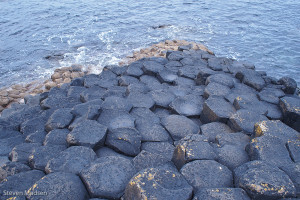 Were they once connected by a basalt land bridge? 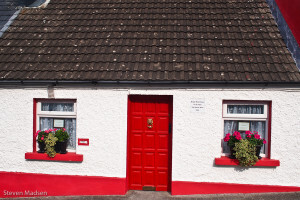 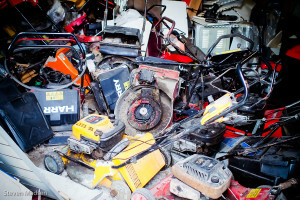 I’m not sure but the possibility brought together two disparate parts of our travels through the United Kingdom in an unexpected and delightfully silly way through the Irish fable. 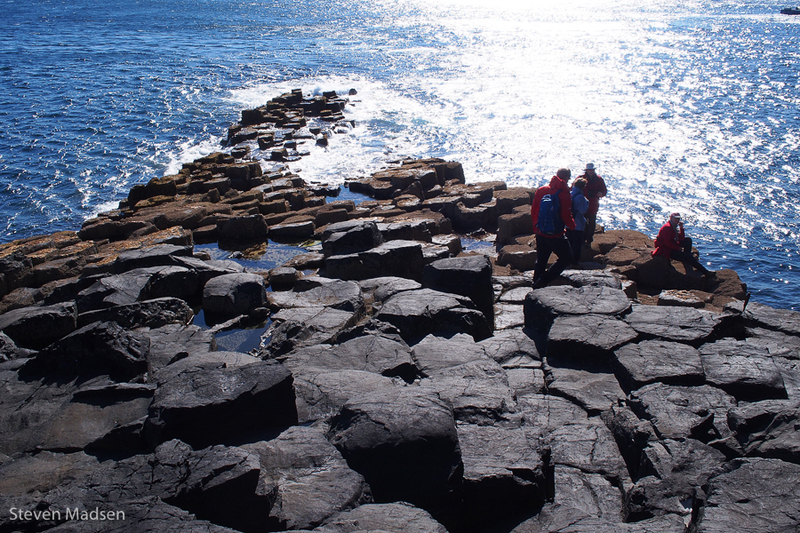 Staffa Island – The Other End? 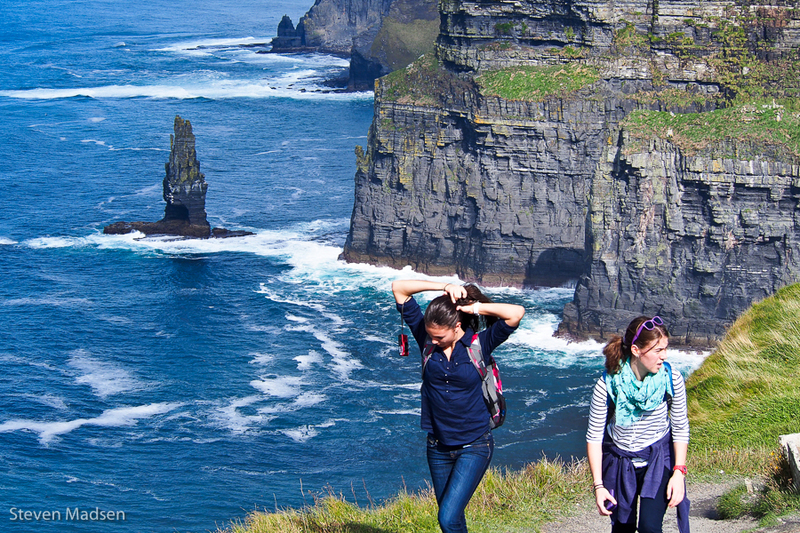 Friendship’s a noble name, ’tis love refined. 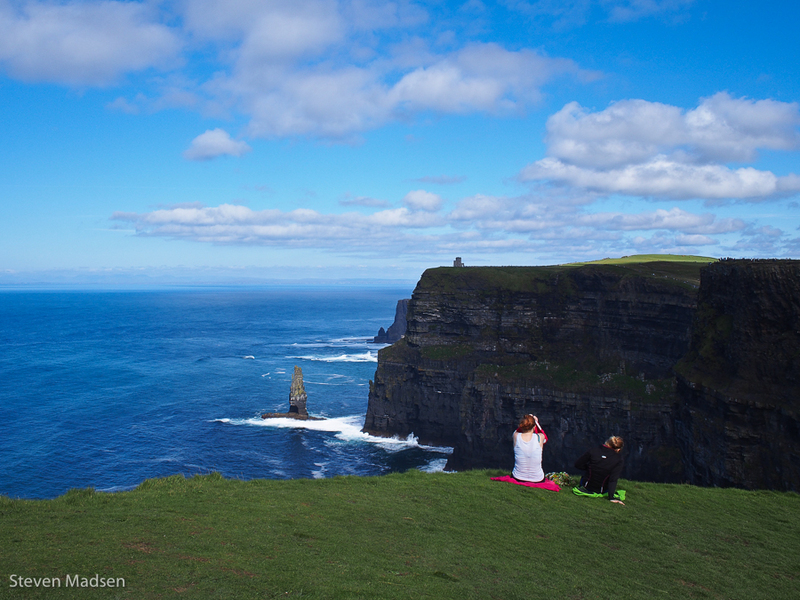 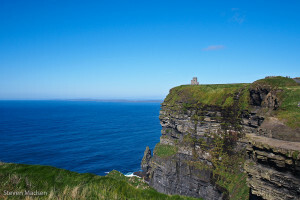 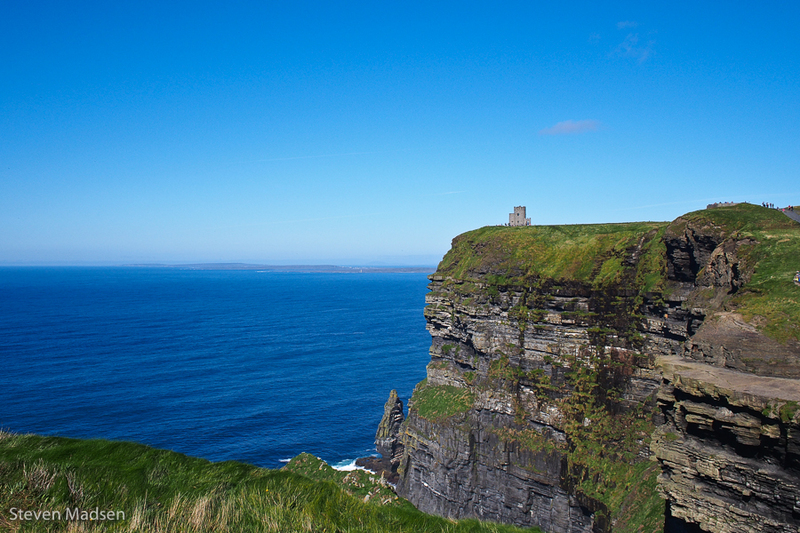 After visiting the Cliffs of Moher, we took a moment solitude at the Well of St Bridget. 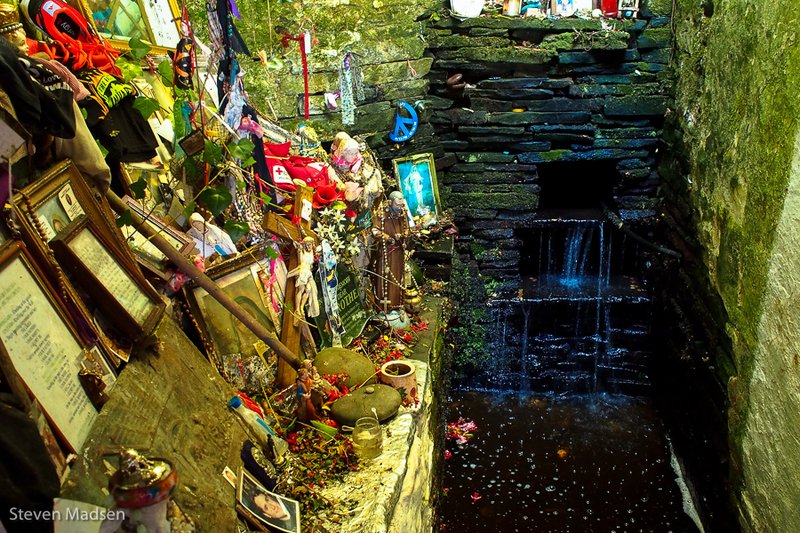 The well is crowded with devotions and gratitude for the Saint’s intervention for the pilgrims who worship at this holy sight. 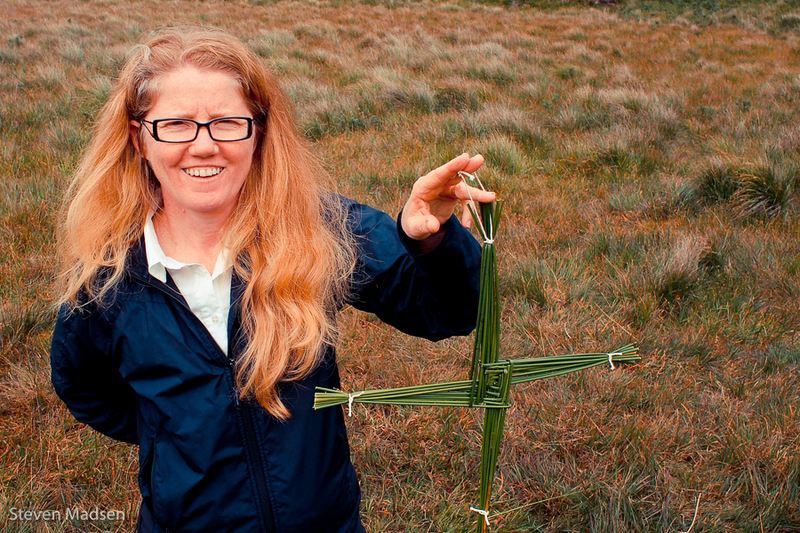 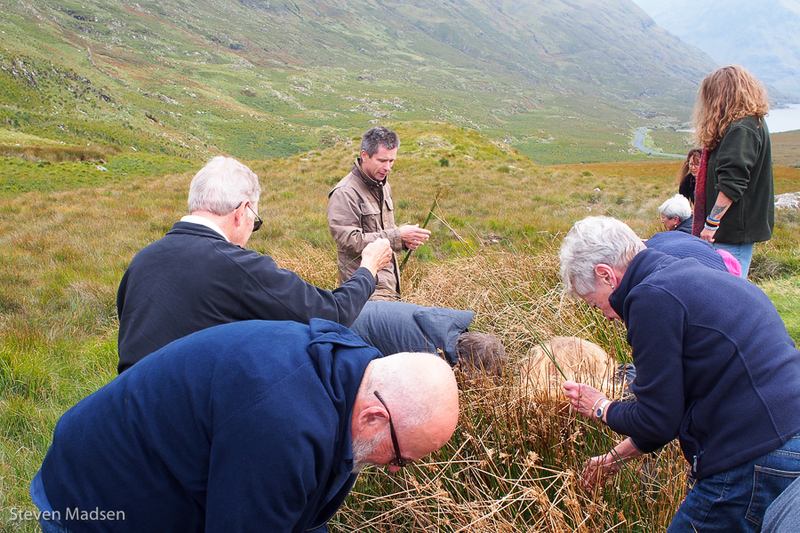 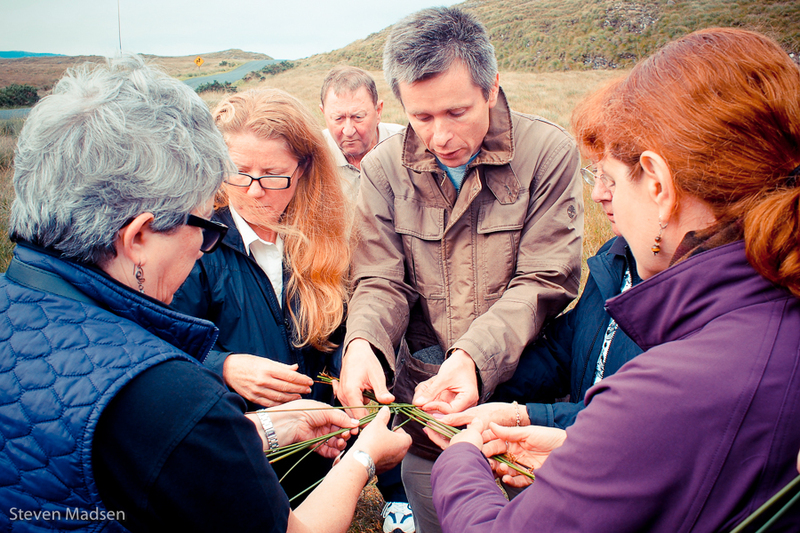 A few days latter, Barry showed us how to construct a simple St Bridget’s Cross from the reeds that abound in the bogs near Leenane. 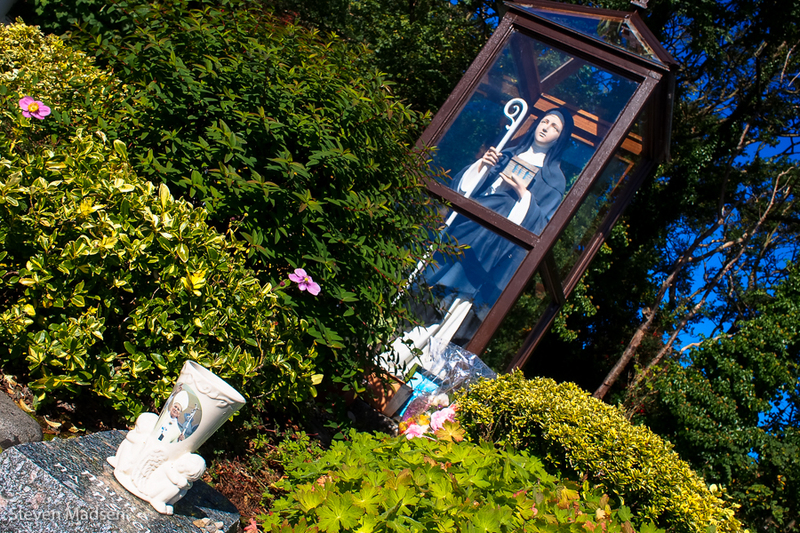 Both stops had special meaning for Colleen whose middle name is shared with the Saint, her Grandmother and our daughter. 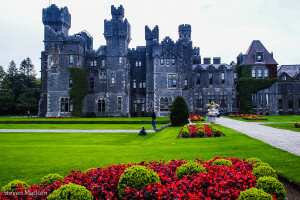 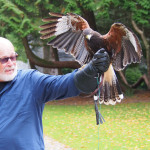 As we strolled through the beautiful gardens of Ashford Castle, I noticed the signs to pointing to the Ireland’s School of Falconry and thought that would be a cool activity. 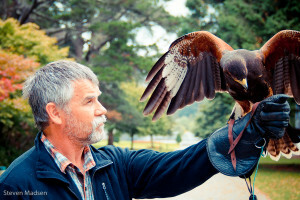 No sooner had the thought crossed my mind, we reached the school gates and Barry announced that we would all be experiencing the thrill of falconry. 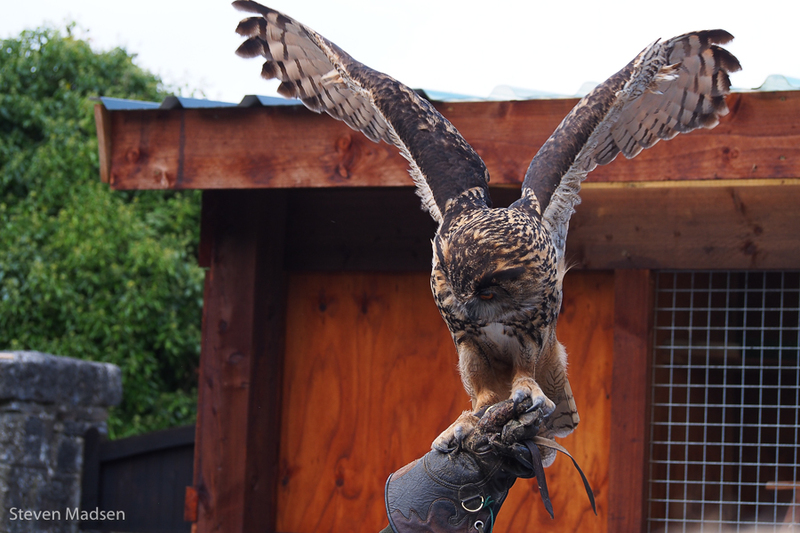 Birds of prey are inherently lazy, only expending their energy in flight when they need to hunt so each bird has a flying weight. 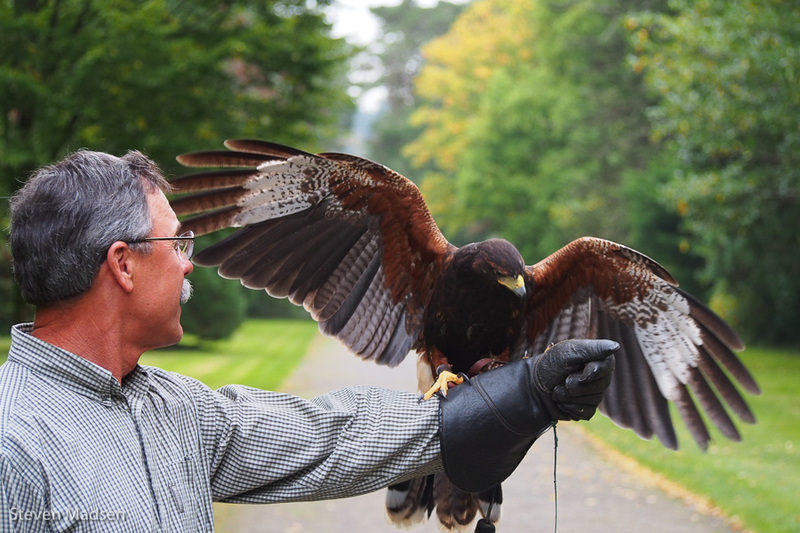 Over that prime weight, the bird will resist flying but if weight drops too low a bird may perish especially in cold weather. 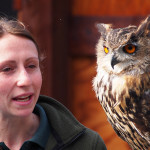 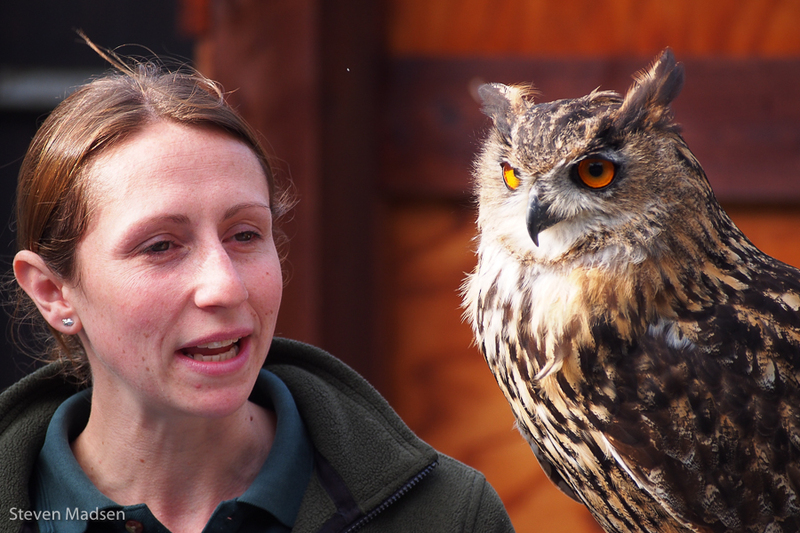 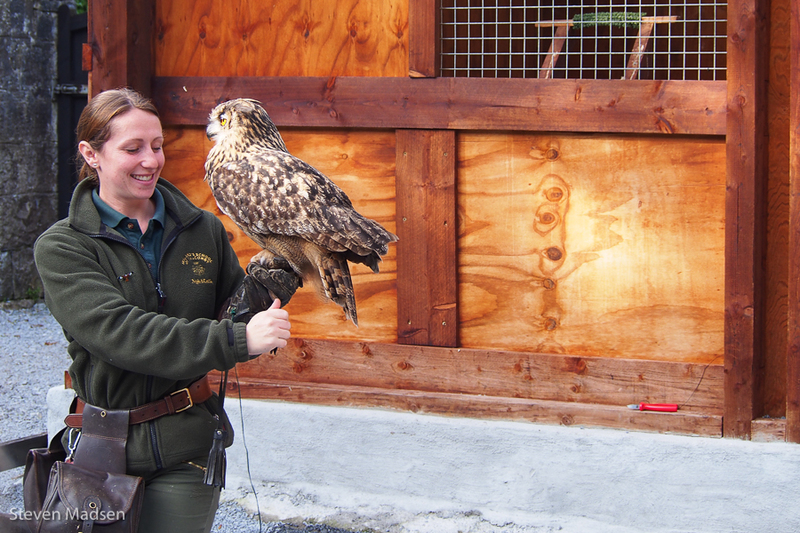 Their handlers weight each bird daily and ensure they remain within a tight boundary of their flying weight, easy right? 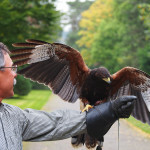 Well, the flying weight changes constantly as birds mature so the handlers are always adapting the flying weight to ensure the birds are at their best. 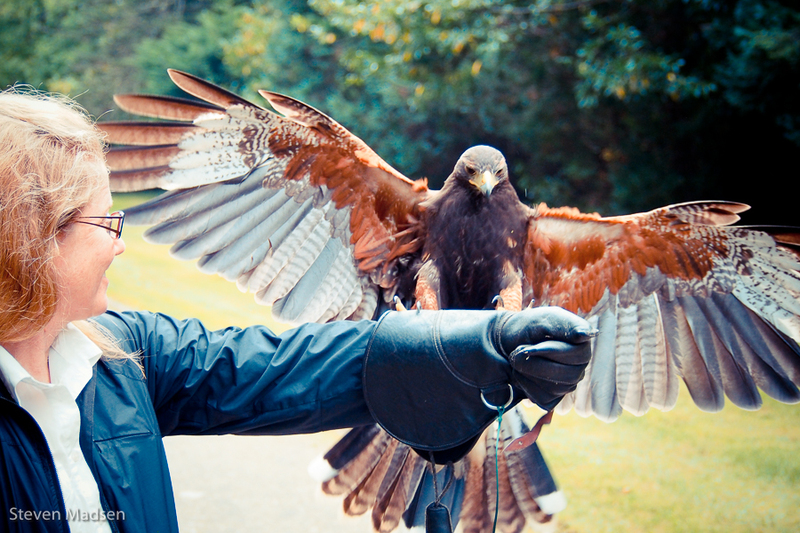 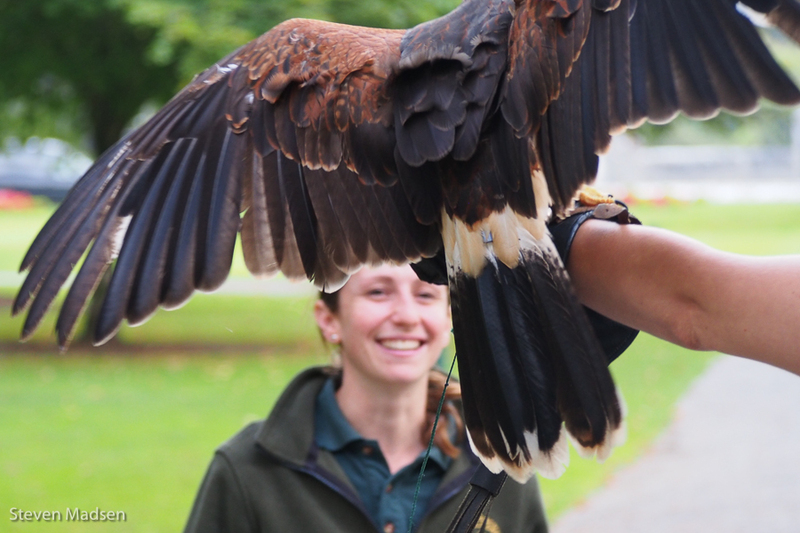 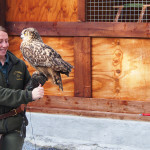 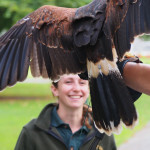 The School has several different species but the majority of students will work with a Harris Hawk, the only social bird of prey on the world. 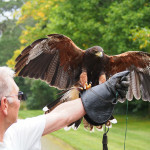 Unlike other birds of prey who are solitary hunters, Harris Hawks hunt as a team similar to lions and this makes them ideal to work with groups of people. 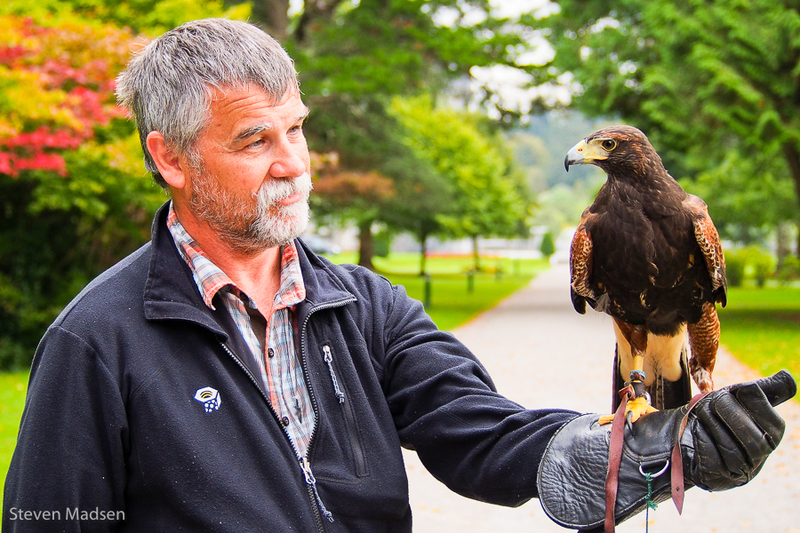 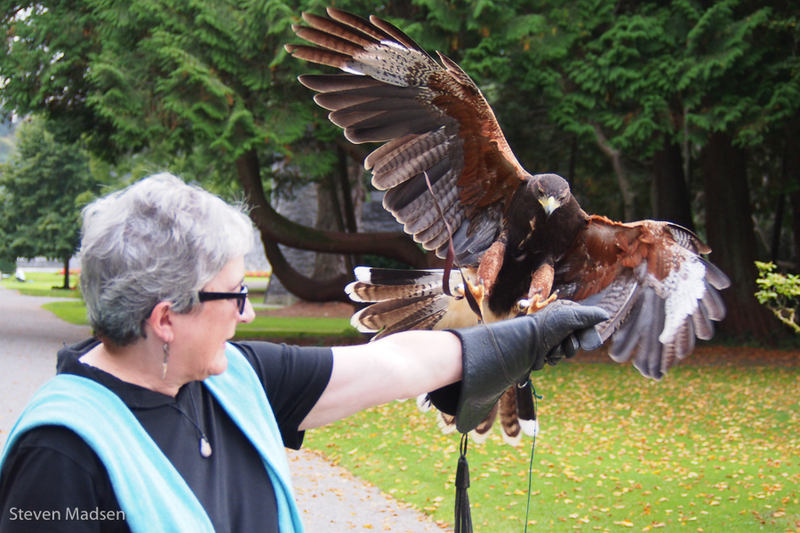 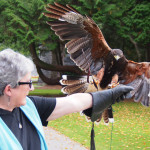 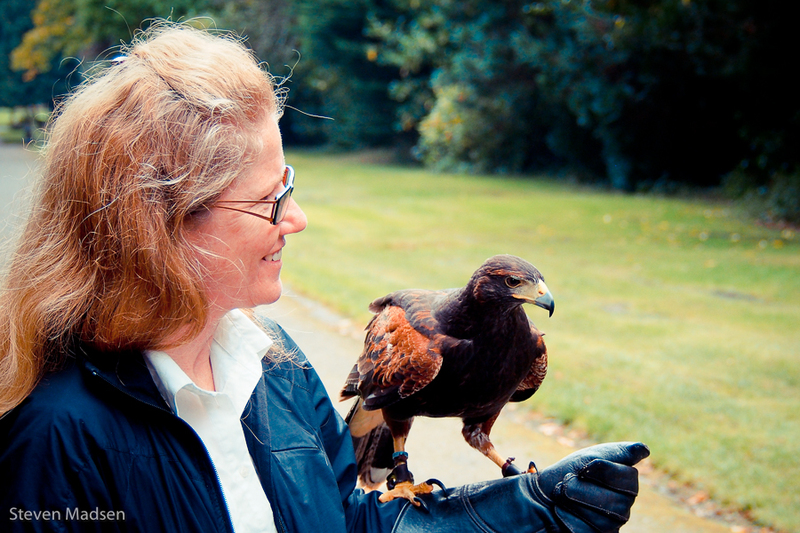 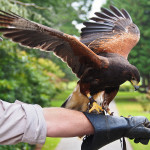 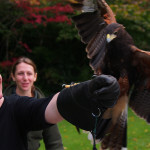 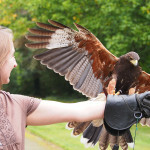 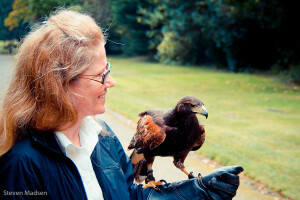 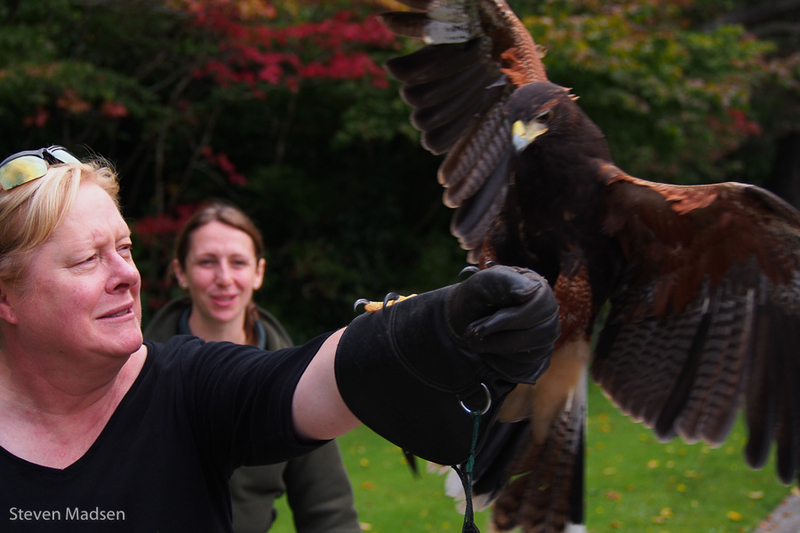 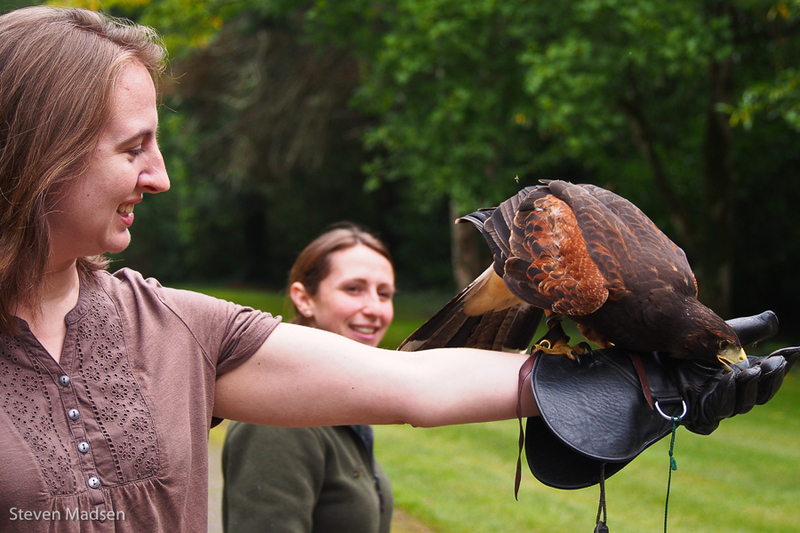 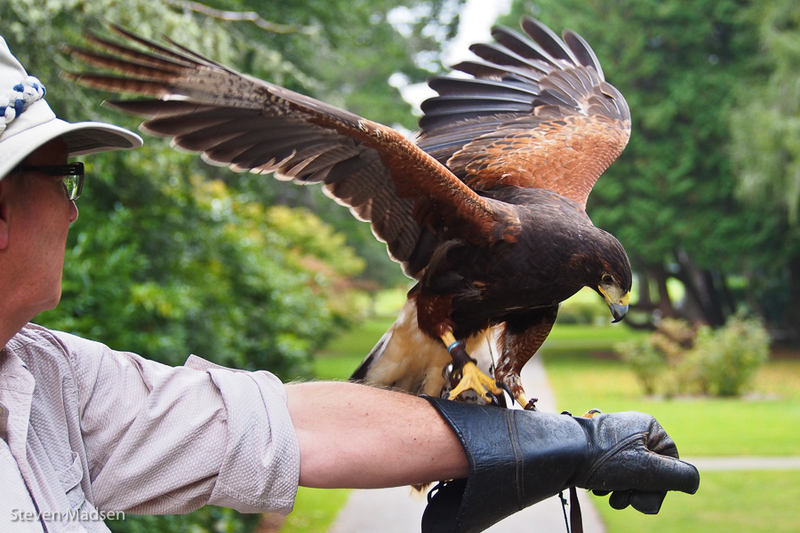 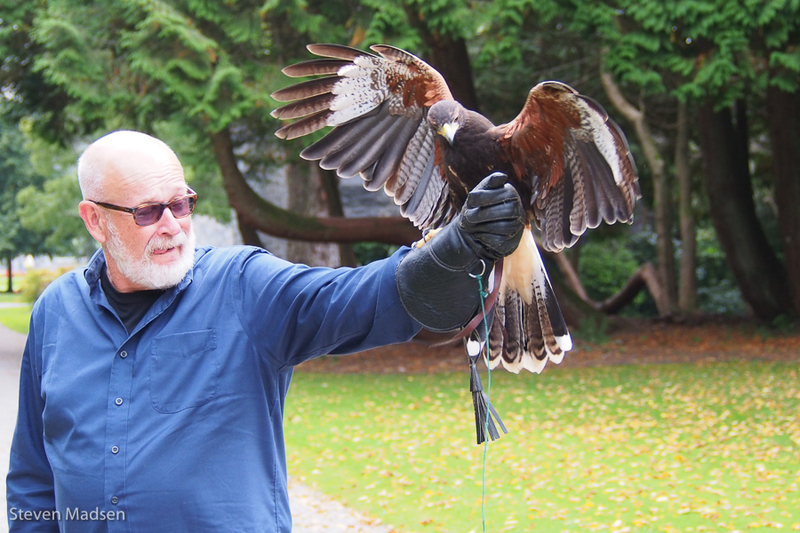 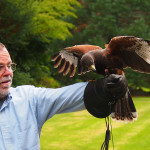 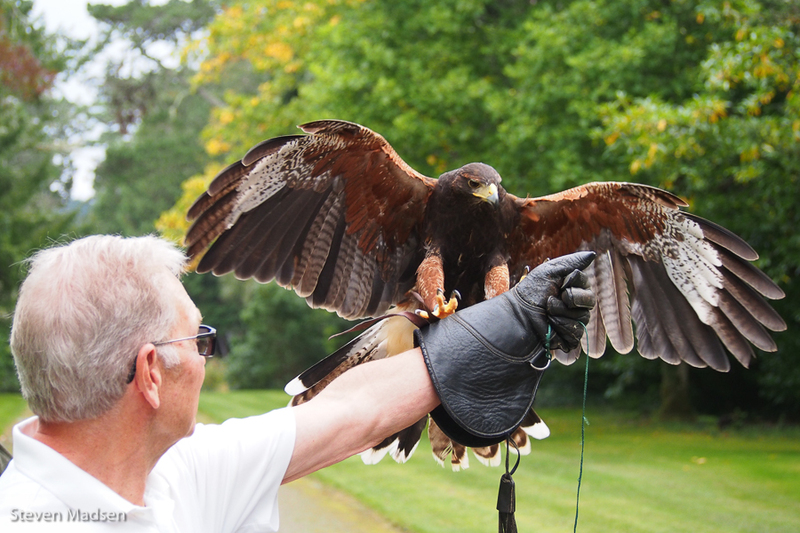 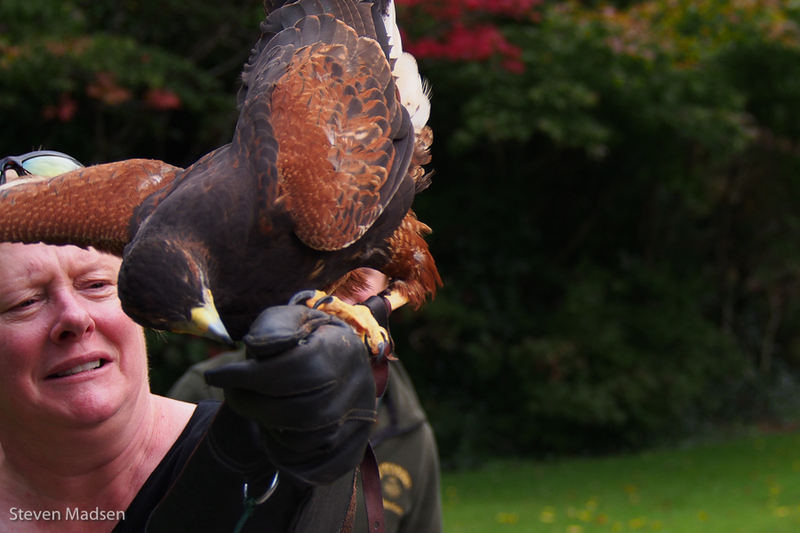 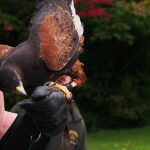 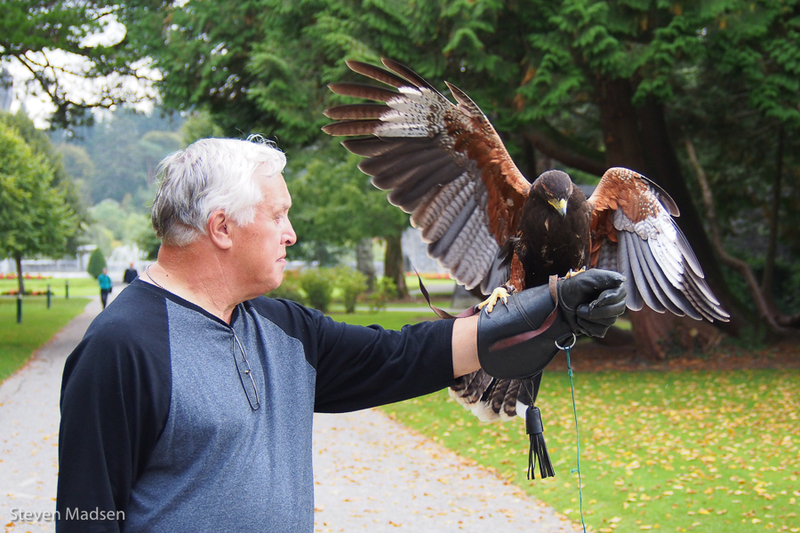 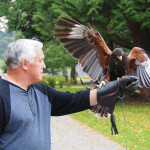 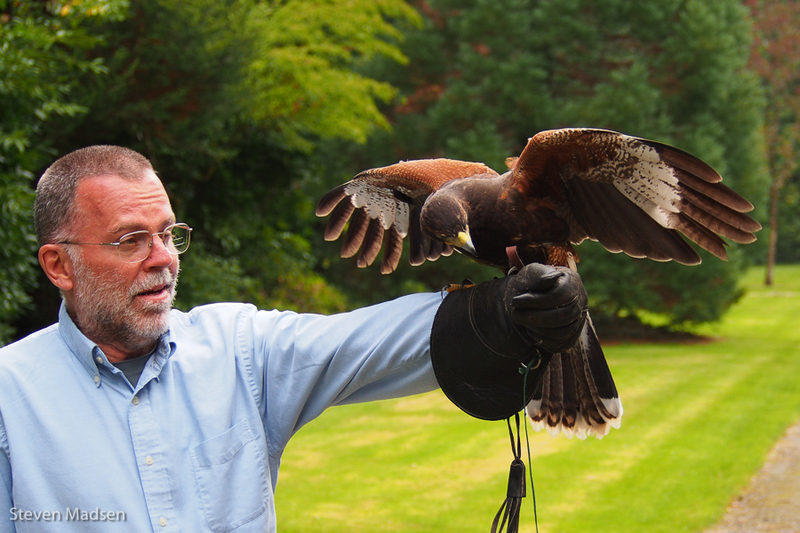 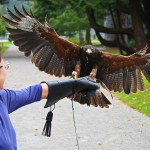 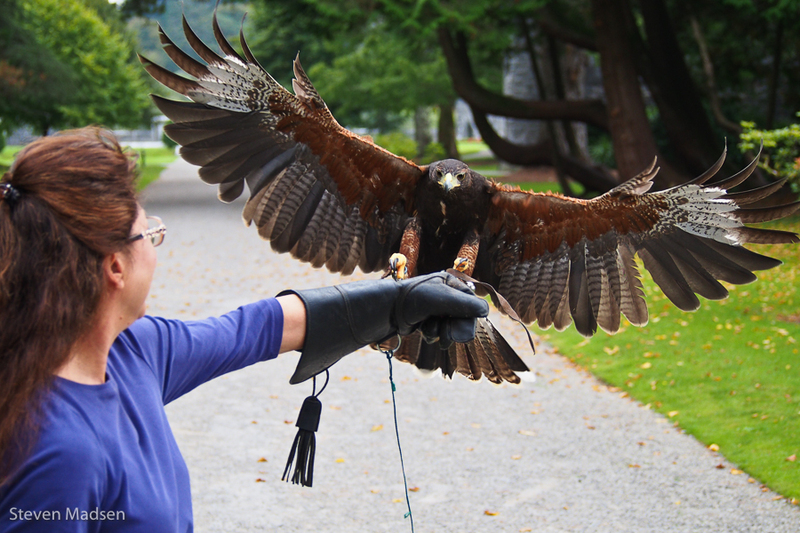 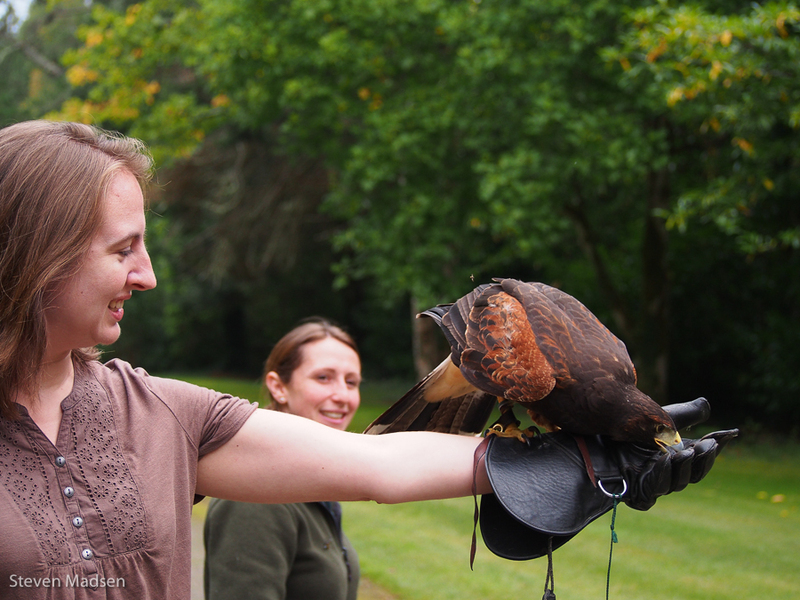 Maya, a young female hawk, became our companion for the morning walk and each member of the group had at least one opportunity to fly her as we strolled the Ashford Castle grounds. 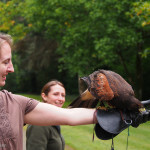 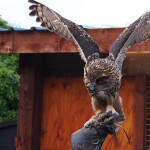 The birds are trained to come to the raised black leather glove and expect the small reward of meat held in your palm, if you look carefully at the photos Maya’s head is focussed on the palm as she lands on the glove. 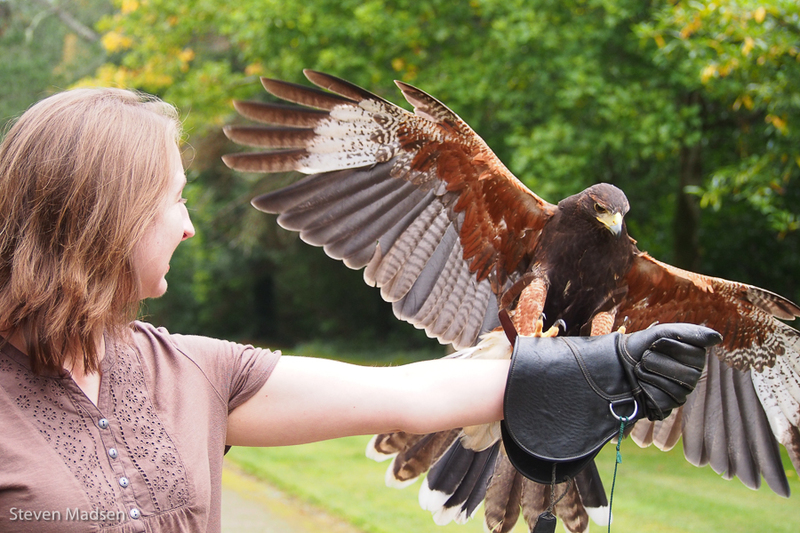 Maya is amazingly gentle as she lands on your outstretched hand, and sits quietly while waiting for you to send her airborne again. 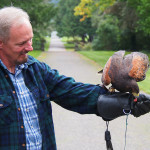 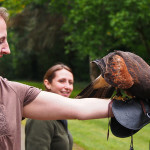 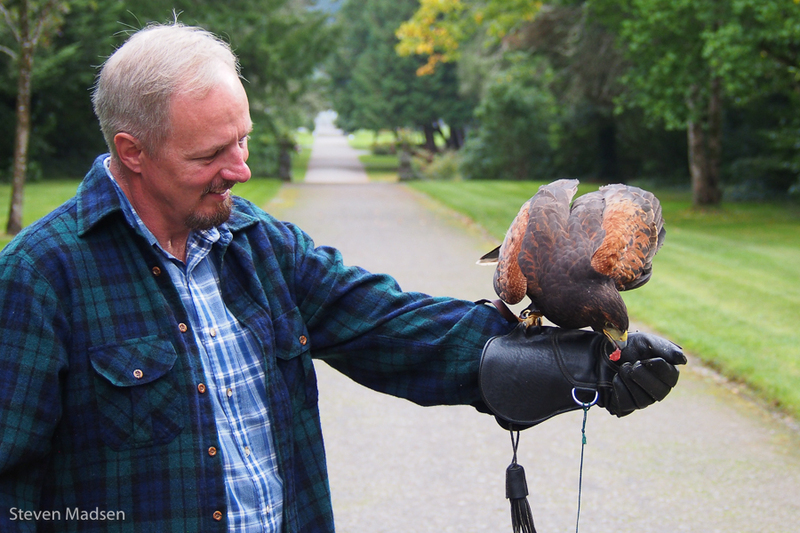 Unlike a parrot or other domestic birds, the hawk never pecks or scratches you and even if she steps off the leather glove her talons never break the skin. A truly magical experience that our whole group will remember as a highlight of a truly wonderful tour. 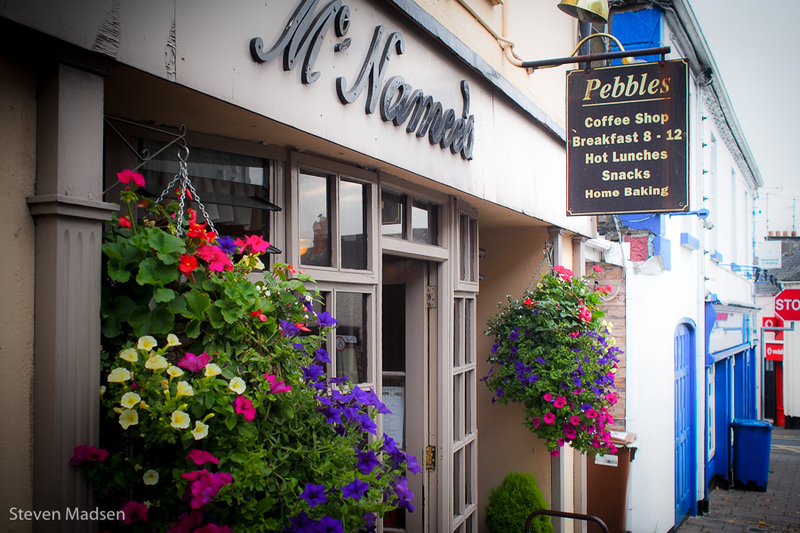 This is not a regular part of the Rick Steves’ 14 Day Best of Ireland tour but I cannot imagine a better addition to an already great itinerary. 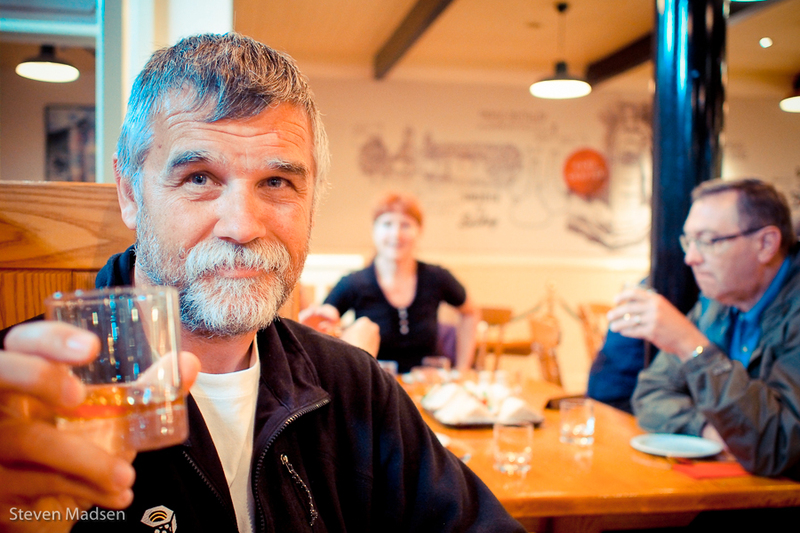 Rick, please make it so. 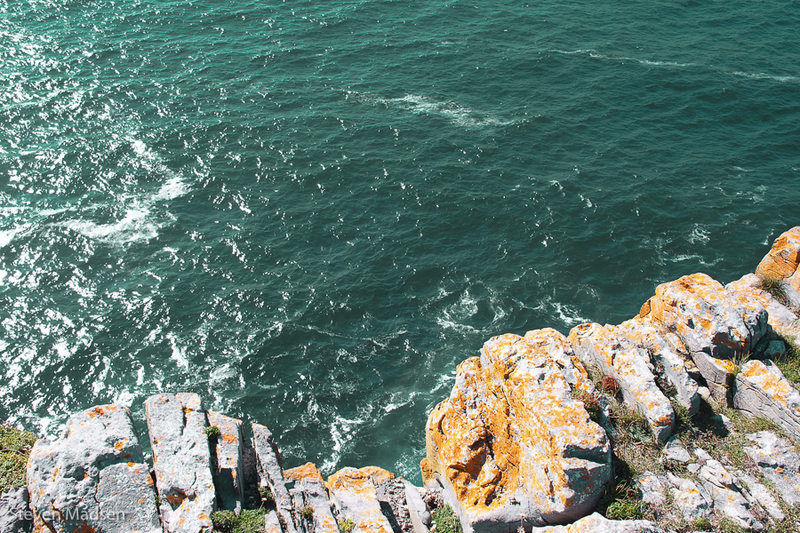 The snot green sea. The scrotum tightening sea. 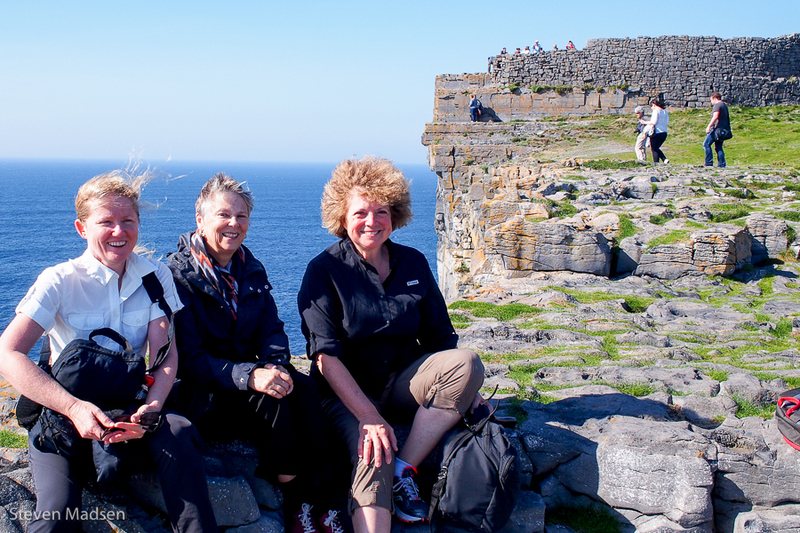 A perfect autumn day, a picturesque island and good friends – is there any better advertisement for an Irish vacation than the pristine beaches and ancient monuments of the Aran Islands? Pascal delivered us to the ferry terminal, and a short boat trip latter we disembarked on to Inishmore for an island tour. 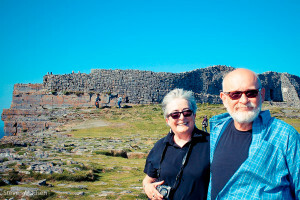 By bike, by horse drawn carriage or by rust encrusted van we set out of from Kilronan ferry terminal to circumnavigate the island, first stop Dun Aenghus. The stone fort sits precariously on the cliff edge, the sea having claimed almost half of the original structure over the centuries but it remains an imposing feature on the island landscape. At the foot of the trial we lunched on the ‘best tomato soup’ (according to Barry), and found it to be a very pleasing lunch for a warm autumn day. 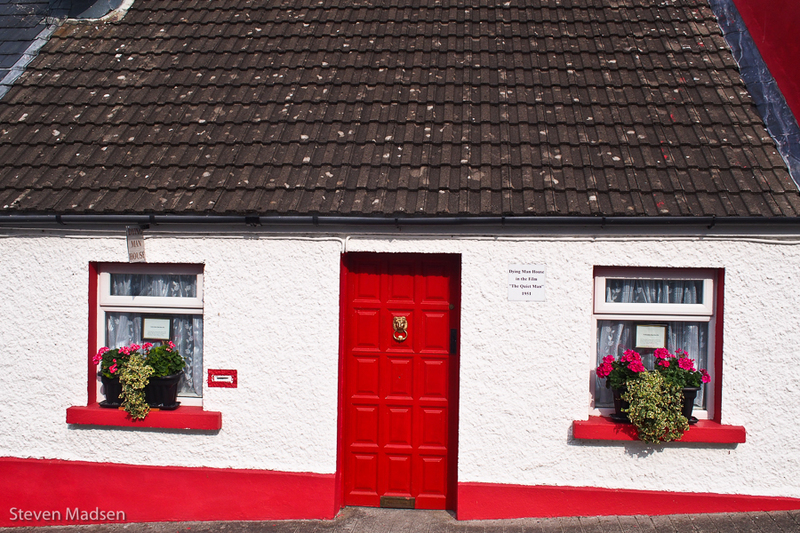 Local shops sell the famous Aran Jumpers made from the local wool, the skill of these knitters is obvious and the intricate textured patterns remind me of the fisherman who relied on these thick woollen jumpers to keep them warm against the freezing Atlantic gales. 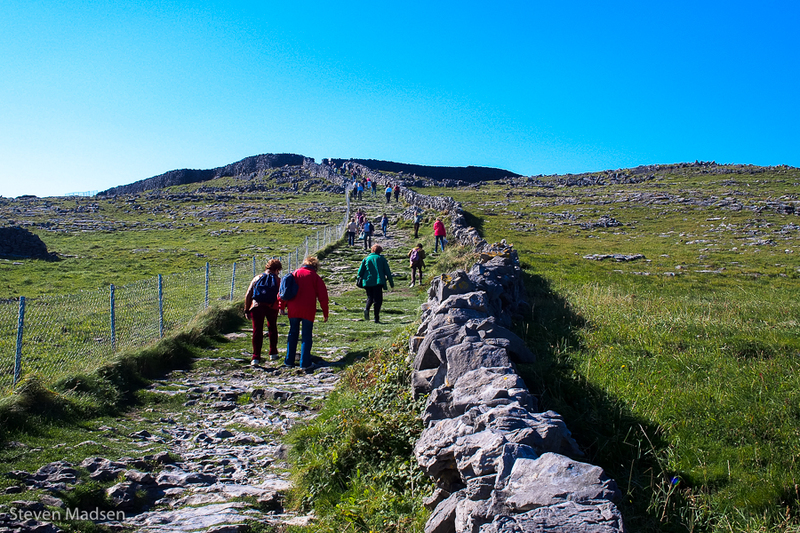 After lunch we headed off to complete our sprint around Inishmore, the island hosted a rich monastic life from 500 to 900 A.D. during the Age of Saints and Scholars including Columba who founded the monastery on Iona that would produce the Book of Kells. In a tiny corner of the Seven Churches, a few graves are marked as the Romans, a testament to the Inishmore scholars these men travelled from Rome to study the Holy texts in this lonely outpost of Christianity. 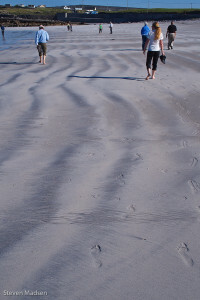 A few hardy souls dipped their toes in the cold Atlantic water but most of us were satisfied with a stroll along the beach with thoughts of summer on our minds. Yugi roams Inishmore, patrolling his domain as the tourists flow across his home like fleas over a dog. His owner is a Japanese Inishmore resident but clearly Yugi is in charge here. 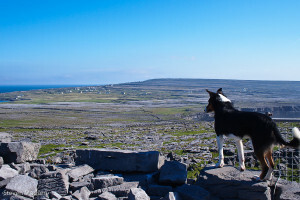 We saw him at every stop from the ferry terminal to Dun Aenghus to the beach, clearly he knew all the shortcuts because he often got there first. Ireland invokes a vision of rolling green fields and rich farming land, yet its landscape yields unexpected surprises like the rocky expanse of The Burren. 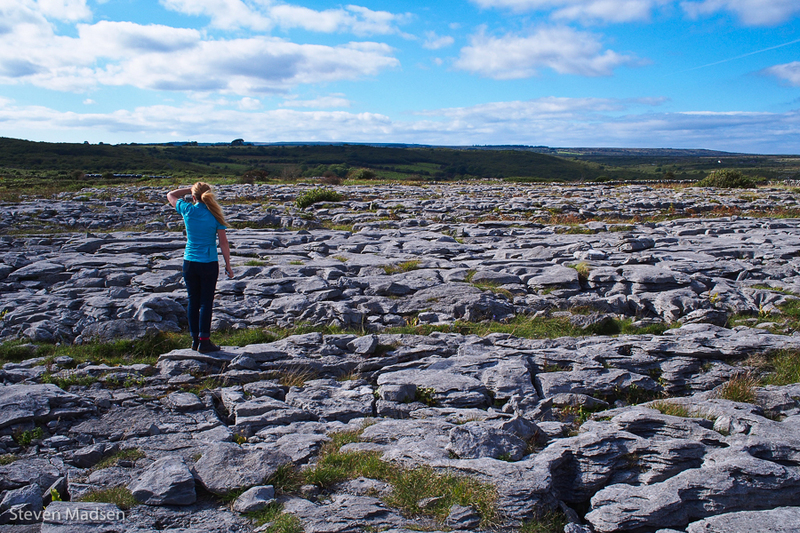 It reminded me of Australia, a seemingly desolate and savage landscape that hides a richly diverse and productive ecosystem. Created out of the geological chaos of the Ice Age, and the acidic mixture of limestone and rain that drilled holes into the surface to harbour the meagre Burren soils to support the greatest diversity of plants in Ireland. 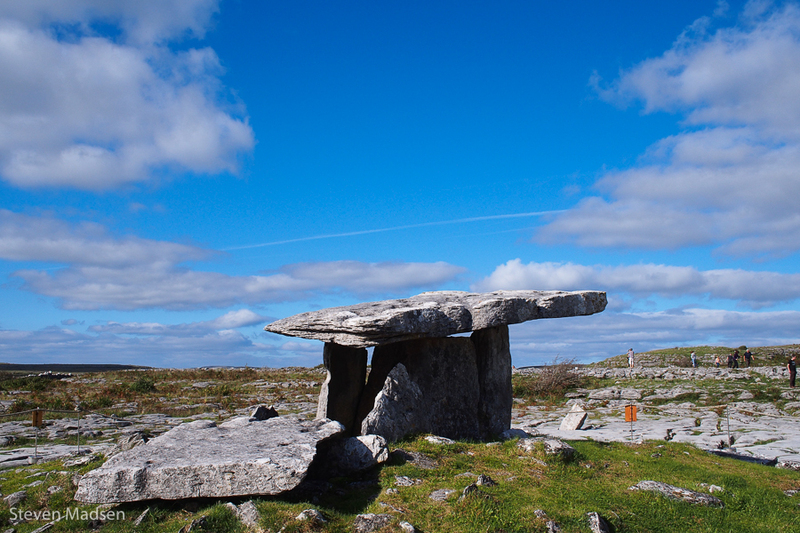 Arctic and Mediterranean wild flowers bloom together in The Burren, and drench the grey landscape in colour throughout June and July. 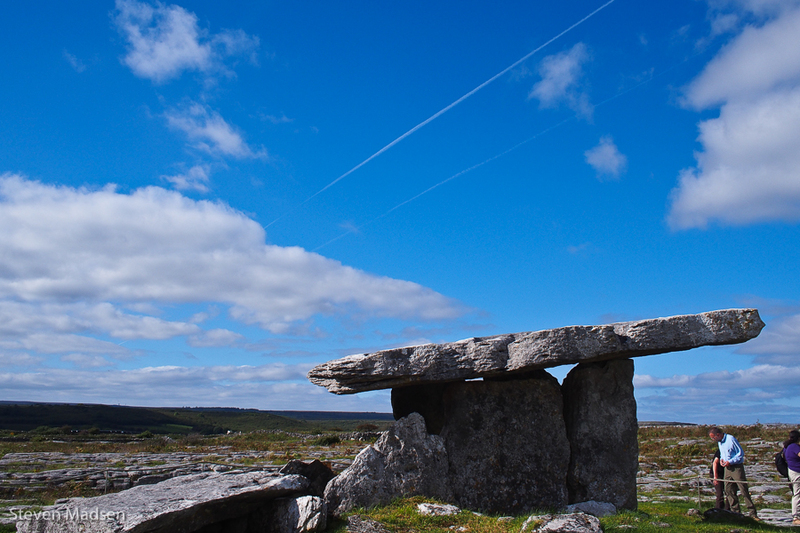 Poulnabrone Dolmen is an ancient portal tomb originally mistaken for a Druid’s altar because the cairn of tones that once surrounded it have been carried away to build cottages and fences. Like similar tombs, the tomb is orientated to the Sun’s annual cycle of life. 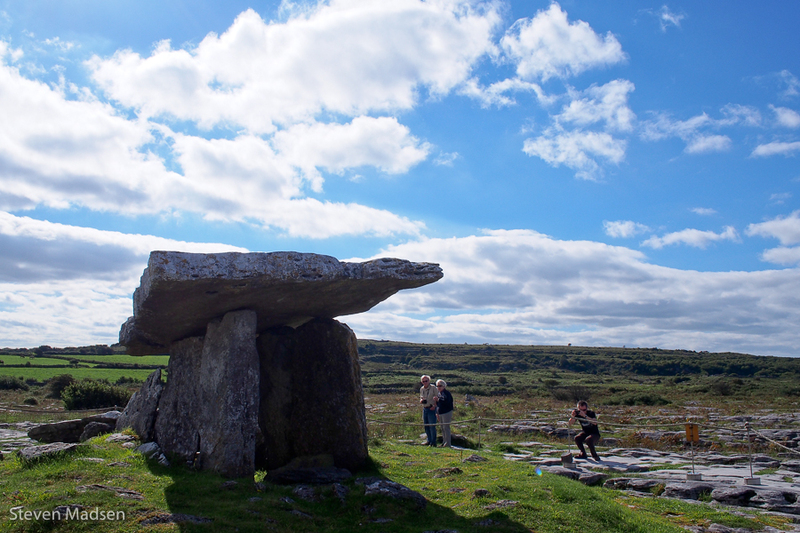 The effort expended by people to build this edifice to their gods and ancestors drew me into the sacredness of the landscape. 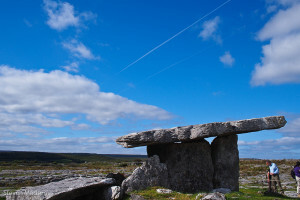 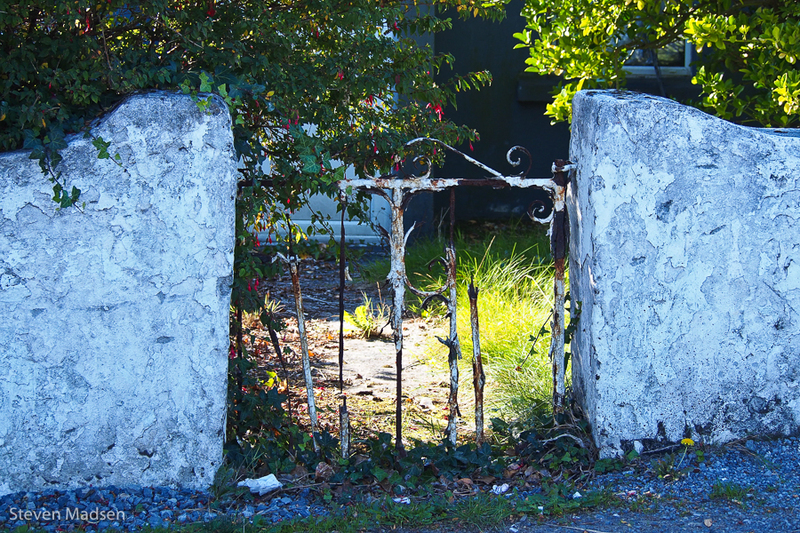 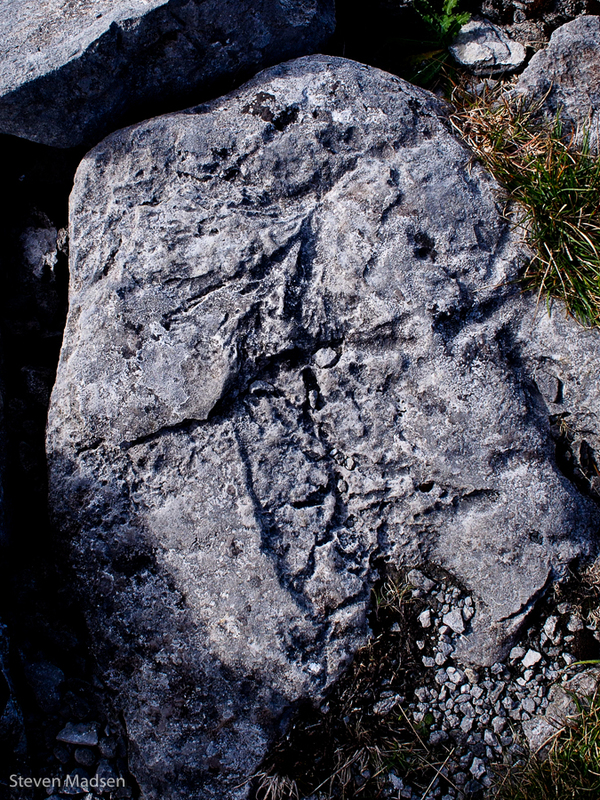 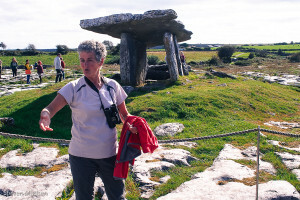 Successive generations have worked with the Burren’s natural gifts to create an abundant environment within which they survived and thrived into the modern era. Mary, our guide on The Burren. 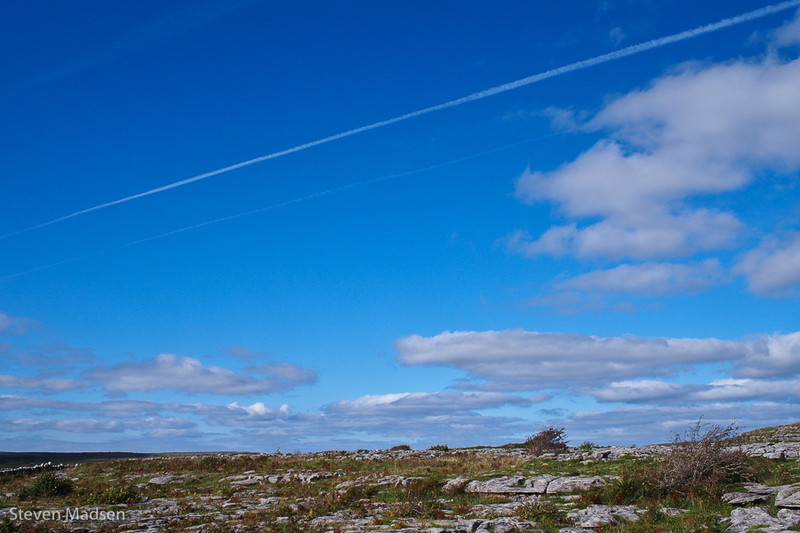 The Irish landscape is rich in colour, majestic and occasionally dangerous for the unwary traveller. The Cliffs of Moher thrust out of the Atlantic Ocean as great bulwark against the ferocious storms that pound the coastline, and carved their fury into the cliff face. A fenced pathway and local rangers are there to keep visitors away from the cliff edge but as many clamber over the fence as those that trod obediently along the safe route. 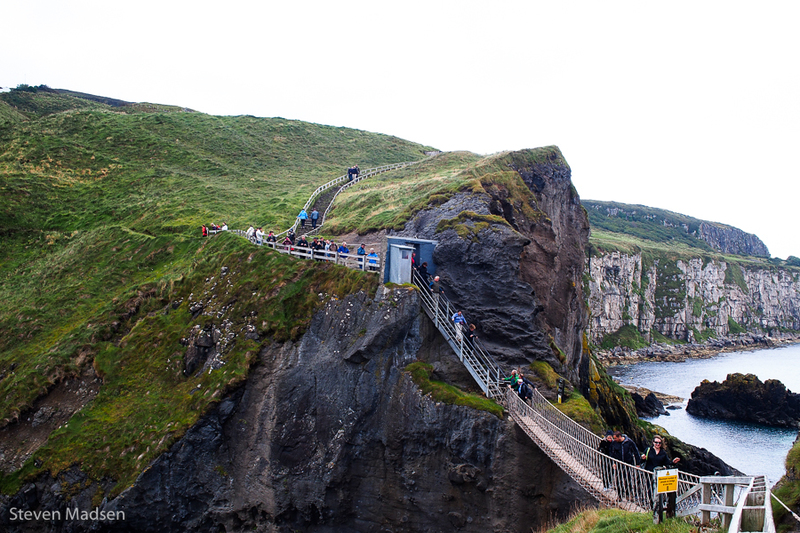 Wind gusts and crumbling edges can catch the unwary, and many people have plunged to an untimely death here. But the sense of freedom and exhilaration of sitting on the edge of Ireland is hard to resist while we ate our simple lunch and enjoyed the view. 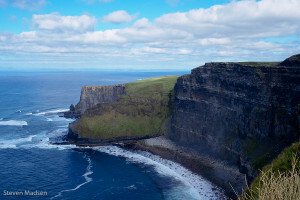 Not content with the danger on the cliff tops, Irish surfers plunge down massive walls of water at the cliff base to challenge nature on the water’s edge as well. 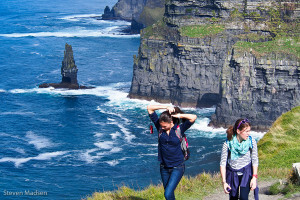 We loved the view but we will leave the surfing to the Irish.